Ernst & Young Sri Lanka recently held its inaugural Charter Installation Ceremony of the EY Toastmasters Club, creating a platform for their young professionals in the highest performing teams, to enrich exceptional client servicing skills in the EY journey of building a better working world. EY Toastmasters will be a member club of the Toastmasters International under District 82, which has won the award of The Best Toastmasters’ District in the World for 2017/2018, out of 105 Districts spreading over 150 countries worldwide. 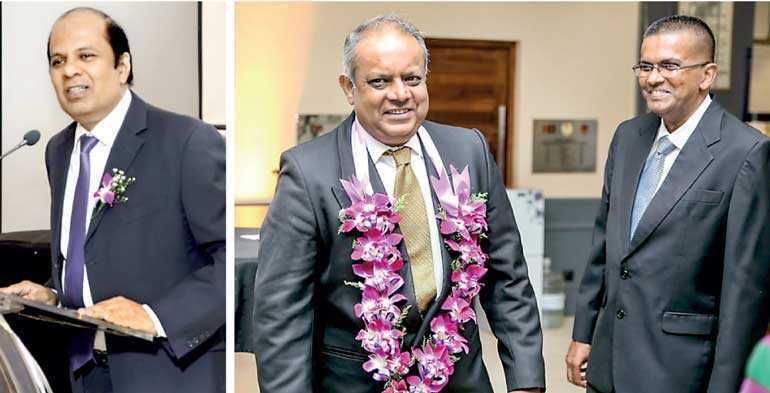 The Charter Installation Ceremony was held recently at the SSC with the participation of Fairfirst Insurance Ltd Institutional Business Director Ramal Jasinghe gracing the occasion as the Chief Guest. In his speech, he emphasised the importance of soft skills, and how Toastmaster Clubs can help achieve excellence in communication and leadership skills. Toastmasters International District 82 was represented by the District 82 Program Quality Director TM Sarmaa Mahalingam as the Guest of Honour for the evening, Division C Director TM Udeni Gnaweera, Division C Assistant Director (Club Growth) DTM Muhammed Sheikh Ahmed, Area C1 Director TM Fawaz Jainudeen, Immediate Past Division Director DTM Keerthi Wijekulasuriya and Immediate Past Area C3 Director Gayathri Pathmaraja and the members of Awakening Toastmasters also attended the evwent. were installed by Division C Director TM Udeni Gnaweera. Division C Assistant Director (Club Growth) DTM Muhammed Sheikh Ahmed inducted the new members. The keynote speaker, Executive Coach, Corporate Trainer and Motivational Speaker Dr. Mahesh Jayasinghe, elaborated on the importance of personal branding and how Toastmasters Club can help in building confidence, as well as the art of effective communication. Ernst & Young Sri Lanka Country Managing Partner Ruwan Fernando conveyed his sentiments, stating that EY as a professional global leader in their commitment to building a better working world for their people, clients, and community, initiated the EY Toastmasters Club to help develop effective communication in delivering exceptional client service. EY Toastmasters Club Patron Partner Arjuna Herath and other Partners, namely Anoji De Silva, Averil Ludowyke, Nishamani Silva, Hiranthi Fonseka, Roshini Fernando, Sulaiman Nishtar and Principal Praveen Ruberu, were among the distinguished guests. The platinum award winning Awakening Toastmasters Club extended their cooperation as the Sponsorship Club in forming the EY Toastmasters Club. Senior Manager (Learning and Development) Thusitha Keerthisinghe coordinates the EY Toastmasters Club. According to the Universum Annual Global Employer Branding Survey 2017, EY was ranked as the Most Attractive Professional Services Employer in the world, and EY is the 4th Most Attractive Employer overall in the world.